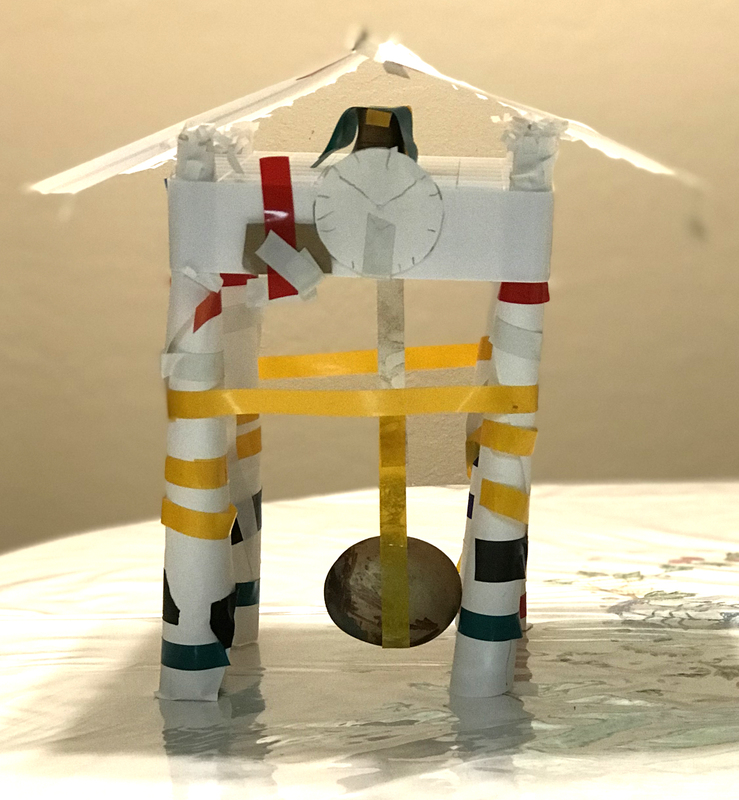 As promised, today’s post features my grandson Will’s construction of the Hillsdale Clock Tower, whose clock was stopped by a bolt of lightning at 10:04 PM, that stormy night in 1955. Below is a photo that details the bell, spire and clock face. Will fashioned the brass bell from the mortar part of an old miniature mortar and pestle set; the spire from a picture-hanging nail. He drew the clock face himself. The pendulum (pictured above) was my idea. We used electrical tape to suspend one of the stones that Will painted. 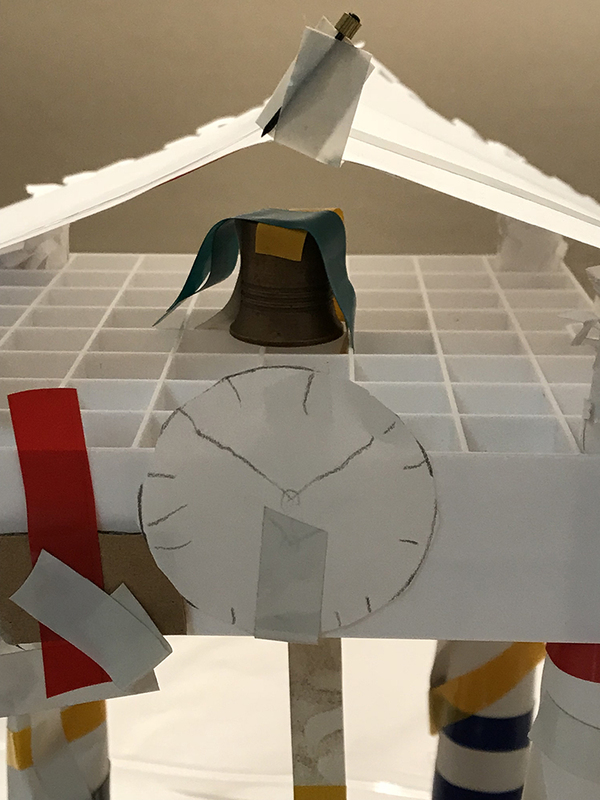 This entry was posted in Personal Stories and tagged art, artistic expression, Back to the Future, clock face, clock tower, construction, grandson, model, photograph, sculptural art. Bookmark the permalink. Just wow. Your grandson is quite a kid. And builder. Well, it is certainly appropriate for building and I’d love to see the act. I remember doing it as part of a game where you held hands up like the bridge with another person, singing, while the other kids ran under it and when the end came whoever was going under the bridge “fell” on them was caught in the lowered hands, and then we sang, take the key and lock Her/him up.. and bounced that person back and forth good and hard swinging our arms. and we all found this just hilarious. Well, enough of that, how did I hijack this comment into a precis of the game? Anyway, loved your whole story. he puts the pillow back up and starts again. I used the verse ‘iron and steel will bend and bow’ as a teaching moment and showed him the famous film clip of the Tacoma Narrows Bridge disaster of 1940. That got his attention. I bet! I’ll repeat it, you have have a cool grandson. ’nuff said. I will tell my kids about the London Bridge game you described. Sounds like fun! Thanks for all your comments and your interest! Will is going to e a great artist. I hope he will continue to explore all the wonderful things in life. Thank you, Eva. My pleasure.